Finally, the more miles a car gets per gallon of gasoline, the more money the owner saves on fuel costs. Given the importance of fuel economy, the federal government administers programs to provide information to consumers about fuel economy and to encourage the production of fuel efficient vehicles. Walk, bike, take a bus or carpool whenever possible. If you own more than one care, drive the one that is most fuel-efficient. Combine your errands into one trip, and consolidate trips to destinations close to one another. Also, plan your errands so you won’t have to retrace your route, and once you arrive, park and walk between destinations. Don’t leave your car idling. If drive-through lines are too long, you can save gas by turning off the car, or parking and going inside. Limit car warm-ups on cold mornings. Use “free” air conditioning. The wind doesn’t cost a thing. So when the heat is bearable, turn off the AC, roll down the windows, and take advantage of the breeze. Avoid “jackrabbit” starts by accelerating gradually whenever possible, and anticipate stops to avoid sudden braking. Remove unneeded items from your car or trunk, since the extra weight decreases gas mileage. You can reduce drag by placing necessary items inside the car or trunk instead of on roof racks. Slow down. 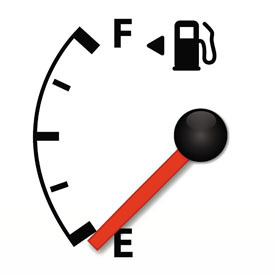 Your gas mileage can increase by 15 percent if you drive at 55 mph instead of at 65 mph. Use the overdrive gear as quickly as possible. If your car is equipped with overdrive gearing, use it as soon as your speed is high enough. And remember: If you have a manual transmission, the lower the shift speed, the better the fuel economy. Keep your tires properly aligned and inflated. Underinflated tires can cut fuel economy by 2 percent per pound. So if your tires should be at 32 psi and they’re at 27 psi, you’ve cut your mileage by 10 percent. Get regular tune-ups to avoid fuel economy problems due to worn spark plugs, dragging brakes, low transmission fluid, etc.